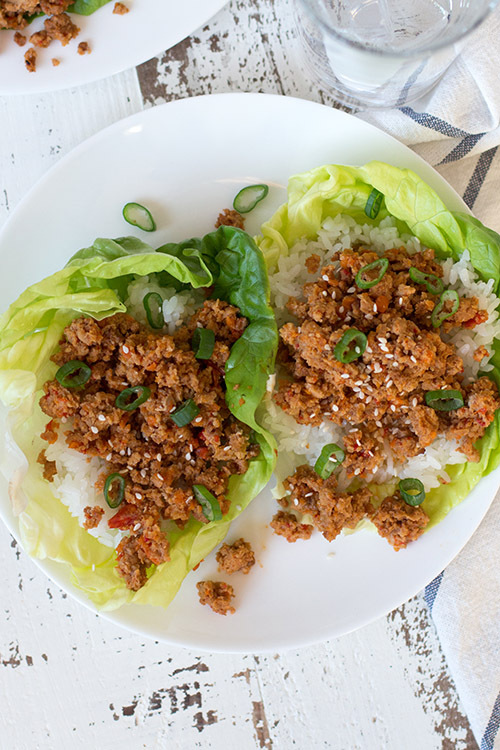 This recipe for slow cooker Asian chicken lettuce wraps is sweet, slightly salty, and so easy to make. If you think slow cooker recipes are only for cold weather, think again. Add this light and delicious recipe to your must-have list this summer. These slow cooker Asian chicken lettuce wraps were a last-minute addition to my CROCK’D Slow Cooker Freezer Meals eBook, and I’m so glad they made the cut. We’ve already eaten them several time and can’t seem to get enough of this yummy recipe. I’ve tried making this recipe with ground beef and ground turkey instead of the chicken and both are delicious. The finished dish is meant to be served on crisp pieces of lettuce, but you’re welcome to eat it on soft tortillas or a salad instead. Embrace the versatility of this simple recipe and turn the leftovers into a whole new meal. Cook fresh or freeze to cook later. Serve on big pieces of iceberg or Boston bibb lettuce. Break apart chicken and mix with sauce in slow cooker. Would this work with chicken breasts as well? Could they be shredded after cooking? I’m not sure how the texture of shredded chicken breasts would work with the lettuce wraps, but I think the taste of the chicken would be really good. 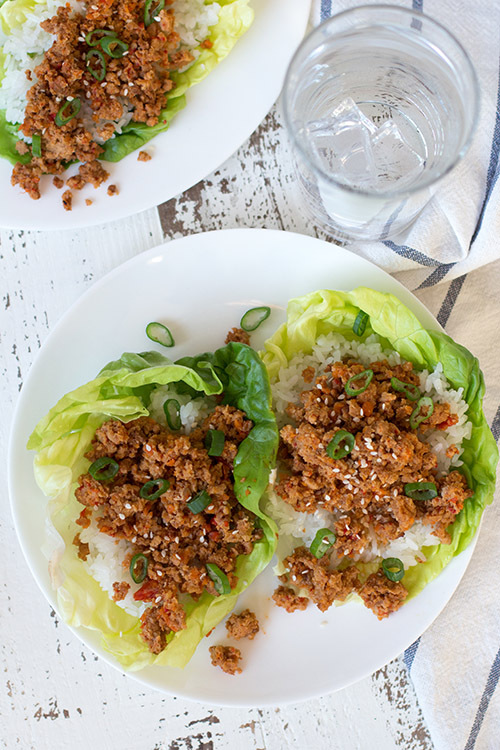 I have made lettuce wraps with OTHER recipes, and ground works great!!! I actually use my Cuisinart to make my own ground chicken breast. Makes the quantities go farther. BJohnsonPDX, how do you use the Cuisinart to grind the chicken? Wendy, that was my first thought as well. I will definitely be using chicken breasts for this. Buy a slow cooker with a timer. Best investment ever. Or just a regular timer for the slow cookers you already have; that’s what I do…. works great! I feel like I am not connecting what the difference would be between a slow cooker with a timer and using a lamp timer. My cooker has 4,6,8,10 hours on it and then moves to a “warmer” setting. When I read your post at first, I thought that’s a great idea as I was assuming you meant a delayed start. Then as I read the follow up posts. realized I was not understanding what you meant. Is it possible for you to indicate what model you use or know that has a timer then? It’s not a “delayed” start, it starts cooking immediately and then switches to “warm” after a specified cooking time. I think your slow cooker will work perfectly. Here’s the crock-pot that I use. I just wanted to mention something I found out recently. A lot of crockpots, especially the ones from China, have a lead pot. I believe the one you’re using does, which leaches into your food. I just wanted to share with you and the other readers as I was in the dark about this until recently. Buy a lamp timer. You get them at Home Depot or Lowes. This allows you to delay the start time of the cooking and allows you to set an “off” time in case you may get delayed. True life saver. The timer works with any crock pot. I don’t recommend delaying the cooking time if there is raw meat in the slow cooker. Using a lamp timer to turn off the crockpot before serving is OK though. The meal should stay warm for almost an hour. I put all ingredients in the crock then store the crock in the fridge overnight. In the morning I set the lamp timer to kick on about two hours after I leave the house. The cold crock acts like a mini cooler for the early hours. I’ve never had a problem with anything getting close to room temperature. Could an instant pot be used to quicken the cooling time after she arrives home? Sometimes I do cook a 4-6 hr recipe at night, for the following night. I store it in the fridge, and then it’s a quick reheat when we get home. Since I’ve done all the prep ahead of time, throwing the next night’s dinner in the crock pot while we are eating the current night’s dinner isn’t a big deal. The best part is my teenager can handle the reheat while her brother sets the table, so we really can eat a balanced meal almost as soon we walk in the door! If i’m going to be away for a whole day i put a frozen meal in the slow cooker on high and that usually works quite well. Some recipes work better than others this way. Mine has a start time and cook time. Just set it and forget it. Make sure it’s not near anything flamible and go to work. ? Some slow cookers or crock pots have multiple time settings and a keep warm setting in addition. They cost a bit more but for working parents this is worth the extra cost. I think that’s what Kelly meant. Kelly, do you have an easy way to print out your recipes? I have a couple of your e-books but how do I print these new recipes without taking up 7-8 pages? Unfortunately, there’s not an easy way to make my free blog recipes print-friendly. I can’t seem to find a plugin that doesn’t mess up the rest of the formatting of my site. I’ll keep looking. Sorry about that, Kerry. If you gave permission for screen shots those can be printed until you work out the print addition to the site. It takes a few steps but copy and paste the ones you want into a word document. Then you can save as a document or print it out from there. You must not be using Evernote!!! The plugin for your browser gets installed and just choose simplified article, Works awesome. 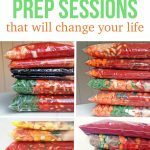 Is it best to freeze just meat and veggies and then add the wet ingredients the morning of? I’m thinking some of the sauces might be lost on the bag. Am I wrong? If you put the wet ingredients in do you mix first before freezing? And do you defrost in fridge the night before every time? Or just for some of these meals? I freeze everything together unless it won’t all fit in the bag (For example, a lot of my soup recipes call for four cups of broth and it won’t fit). 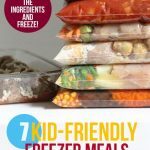 I thaw my meals overnight in the refrigerator before cooking. You list Directions AND To Freeze. 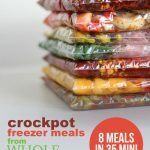 My question is … Do you pre-cook the meal in the crock pot and then Freeze it or are you suggesting one or the other? You freeze everything raw and then cook in your crockpot later. If you want to skip the freezing step and just cook everything in the crockpot that’s fine too. looks like in the picture there is sesame seeds but I don’t see that in the recipe list. Did you add them after? Yes. They were added right before serving. I see rice was add. When do I add the rice? I add the rice to the lettuce while serving.